You may notice that immediately after your tattoo is healed, it looks incredibly bright, and almost artificial appearance. This is due to the pigment being very close to the surface, under a brand new layer of skin that is very highly transparent with no layer of dead skin on top of it. After about six months your skin in the tattoo area has fully recovered and you will be looking at your tattoo through a layer of dead skin cells which contain no tattoo pigment, this will have muted the vividness of your colors somewhat, and given your tattoo a more natural, beautiful quality. Now that your tattoo is fully healed, it will begin the long, constant process of decay. As time passes, the skin cells (in which the tattoo pigment is embedded) shift slightly, causing the tattoo to blur. In addition the body continually attempts to break down and remove the pigment grains, causing your tattoo to fade. Both of these processes occur as gradually as the rest of your body ages, so slowly that you may not even notice, until one day you look in the mirror or see an old photograph of yourself and it suddenly strikes you that you have aged, and so have your tattoos. A common comment by the uninitiated is “what about when you get old and your tattoos are all faded?”. When you are old, your skin will be wrinkly, loose, liver-spotted, and old too, along with your tattoos. What about the REST of your skin? I think old people are beautiful in a different way than the young, but I think tattooed old people are the most beautiful old beautiful. Vanity has a way of diminishing as age turns the tide against our efforts to remain young, and having tattoos will not diminish ones sense of self appreciation any more for an old person than they do for a young person. 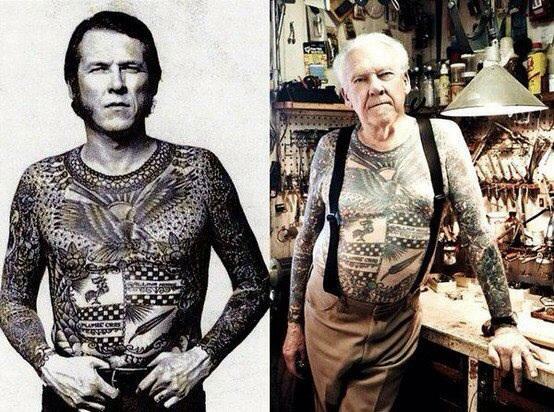 In fact quite the opposite, quality tattoos are enjoyed by the young and the old alike. *Only get simple, bold tattoos by leading industry professionals. * Maintain good overall health with a healthy diet, and regular exercise. Many sun-blocks (all major brands) contain chemicals that are known to CAUSE skin cancer, and may otherwise damage your skin with prolonged use. Do some research and only use natural chemical free sun-block to keep your skin healthy. When the skin is very dry, the layer of dead skin cells get thicker and visually obscures your tattoo. One of the best ways to brighten up your tattoo is to exfoliate, and then moisturize your tattoo. These alone can often make you, and your tattoo appear years younger. It is a common misconception that when your tattoos fade you can just “touch them up”. The term “touch-up” refers to a fine tuning of the tattoo within the first 6 months after completing the work. Any re-coloring of an older tattoo is not a “touch-up”, but rather a “re-work”. Once a tattoo has aged enough that you notice fading or blurring, it is questionable wether re-working it is a good idea. Once an outline has spread, you cannot repair the fine lines, and can only darken the now thicker lines. Re-working the color presents similar issues. Once small details and negative spaces have been swallowed up by surrounding colors, they cannot be reopened or replaced. Re-working older tattoos often only exacerbates the aging issue and will result in very bright, very dark, blurry tattoo. Most of the time it is best to let your tattoos age gracefully. If they were good tattoos to begin with, they will look better aging gracefully than they will with a fresh application of pigment. Also, “re-working” your tattoos will be billed at the regular hourly rate, and so it is perhaps a more prudent investment to get NEW tattoos instead of re-working the old ones..